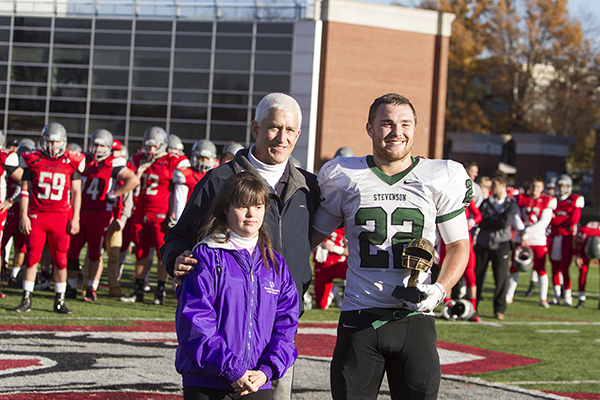 ALLENTOWN, Pa. – In a defensive battle, the Stevenson University football team outdueled Muhlenberg College and used a key stand late in its own territory for a 14-9 win in the inaugural Centennial Conference-Middle Atlantic Conference Bowl Series Saturday at Scotty Wood Stadium. With the win, the Mustangs post their second straight bowl victory in just their fifth season as a program. Stevenson finishes the season 9-2, setting a program record for wins after winning eight games last season. Muhlenberg (8-3) started its final series on its own 19 following a 34-yard punt by Tim Sternfeld. Facing fourth-and-two on their own 37, the Mules came up with a 43-yard completion from Nick Palladino to Nick Lamb to get to the Mustang 20. Back-to-back Palladino runs got the hosts down to their own 7 with 46 seconds left. Coming out of the timeout, Brendan Flaherty sacked Palladino for an eight-yard loss to the 15. On second-and-goal, a false start pushed the Mules back to the 20. On the next play, Billy Lewis came up with his sixth interception of the season on the right side of end zone to seal the victory. The Mustangs scored the lone points of the second half with 5:44 left in the third quarter. On its second drive of the quarter, Stevenson engineered a 13-play, 68-yard drive that chewed up just over six minutes on the clock capped by a 15-yard run by freshman Kiandre Burrell for his seventh touchdown of the season that put Stevenson up 14-9. Stevenson appeared poised to start to put the game away, taking over at its own 33 with just over five minutes to go in the fourth when a Muhlenberg drive that started at its own 1 sputtered just outside the 20. On the first play, a fumble gave the Mules the ball at the Mustang 39, however, one play later, a Palladino pass was tipped at the line and Austin Meyers leapt for the interception, his first of the season. Stevenson took a 7-0 lead with 6:49 left in the first quarter on a drive set up by Brady Kempa's fourth interception of the season at the Muhlenberg 30. Starting on the 26, a 12-yard run by Devonte Williams followed by a 14-yard pass from Brad Harmon to Devin Salisbury gave the Mustangs an early lead. Muhlenberg scored all nine of its points in the first half in the nine seconds. Taking over at the Mustang 39 with 31 seconds left following a blocked punt, Palladino found Lamb in the left side of the end zone for a 26-yard completion with 8.8 seconds left to make it 7-6 after the extra point was missed. The Mules went with a squib kick on the ensuing kickoff, and after a Stevenson player touched the low bounding ball, it was recovered by the hosts at the Mustang 16. Casey Fosbenner booted a 34-yard field goal from the left hash mark as time expired to give Muhlenberg a 9-7 lead at intermission. 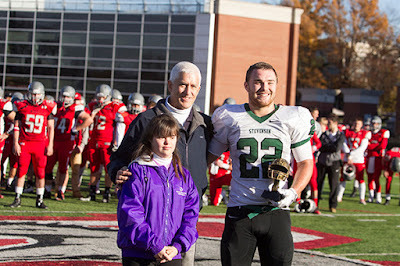 Junior Cory Pietrzyk was named the game's Most Valuable Player after finishing with a team-high nine tackles, including two tackles for a loss and a sack. Pietrzyk finished the season with eight sacks. Stevenson finished with three interceptions in the game and closes out 2015 with 29 on the season, tops in Division III. Both teams had a pair of fumbles, with the Mustangs losing both of theirs and Muhlenberg able to recover both of its miscues. The game proved to be the predicted defensive battle, with Stevenson allowing just 16.4 points per game and Muhlenberg 18.0 entering the contest. Muhlenberg outgained Stevenson 285-264, but the Mustangs had the edge in first downs, 16-14. Stevenson also had the edge in time of possession, holding the ball for 31:25. Burrell rushed 18 times for 89 yards to push him over the 800-yard mark for the season. Harmon was 17-31 passing for 125 yards, with Salisbury hauling in seven balls for 65 yards, while Cortez Taylor caught five passes on the day.